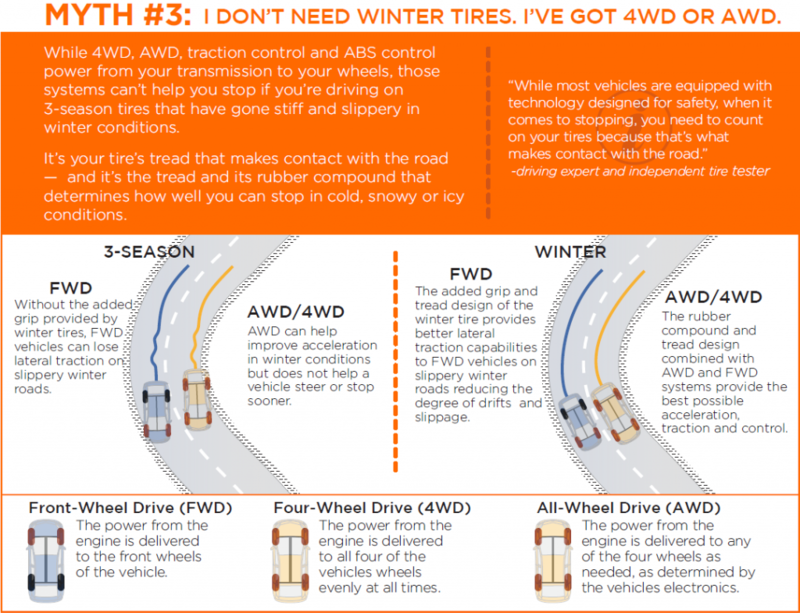 Winter Tires & The #7CSwitch: Are You That Guy? Some of us can remember what it feels like to drive in a car without wearing a seatbelt—either because it was uncomfortable, or broken, or non-existent. And some of us can remember when talking on the phone was a perfectly fine thing to do while driving. In both cases, it’s taken a lot of advertising, awareness and even a bit of social shaming, but now we all (hopefully) wear seatbelts and leave the phone alone while driving—not just because it’s the law, but because we ought to for the safety of everyone on the road. This year, Kal Tire is taking a similar approach with winter tires. Despite the evidence that all-season tires aren’t safe in cold temperatures—never mind snow and ice—many drivers don’t switch to winter tires. So, we’re touring Canada with Amber Balcaen, the first Canadian woman to win a NASCAR-sanctioned race, in hopes of encouraging drivers to switch to winter tires at +7 C the point at which all-season (Kal Tire calls them ‘3-season’) tires become stiff and lose their grip. “As a professional driver, I know my experience can only get me so far, especially in rough and unpredictable winter conditions off the track. It’s my tires that let my vehicle stick to the road and brake in time,” says Balcaen. In 2016, she became the first Canadian woman to win a NASCAR-sanctioned race in the US and has since won another in 2017. Balcaen is a spokesperson for Kal Tire’s ‘7 Degree Switch’ campaign, which likens the dangers of driving on all-season tires in winter conditions to driving while texting or without wearing a seatbelt. Kal Tire is also using the 7 Degree Switch campaign as an opportunity to dispel winter tire myths, most of which lead back to all-seasons not offering safe braking and cornering in cold and snow/ice conditions. 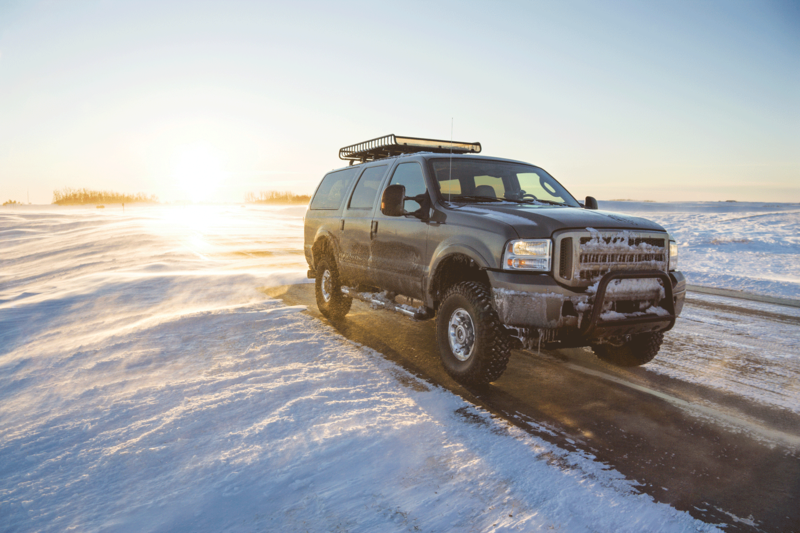 In recent years, Kal Tire has invested heavily in independent tire testing to evaluate the performance of both new and worn 3-season, all-weather and winter tires in Canadian winter conditions. 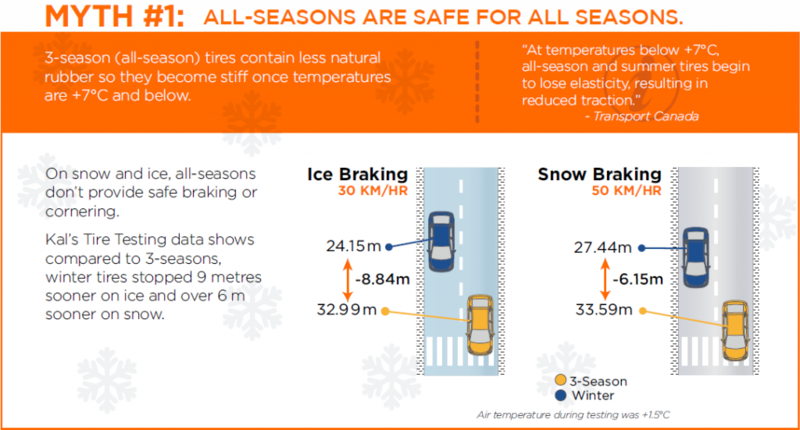 The evidence has been both surprising and significant: from 50 km/h, passenger winter tires stopped over 6 metres shorter on loose snow than 3-season tires and nearly 9 m shorter on icy conditions at 30 km/h. The bottom line: Having the right tires on your vehicle as temperatures fall below +7 C is critical, and it impacts the safety of everyone on the road. That’s why we’re dispelling some of the most common winter tire myths. At Kal Tire, we still hear from customers on the coast or in cities like Toronto who really don’t think they need winter tires because they don’t get a lot of snow, but it’s not about the snow. It’s about the temperature. Three-season tires contain less natural rubber, so they stiffen once temperatures are consistently below +7C. Winter tires, on the other hand, stay flexible for optimal grip and braking at temperatures below +7C, and all-weather tires, which bear the severe service winter tire symbol, are made with a special compound to stay flexible above and below +7C, giving drivers in mild and urban regions a safe year-round alternative. M+S tires are all-season tires. What makes them different from a summer tire is they have more space between tread blocks (a 30 percent void-to-tread ratio) so they can expel mud and snow, but their rubber compound hardens at +7C and below. 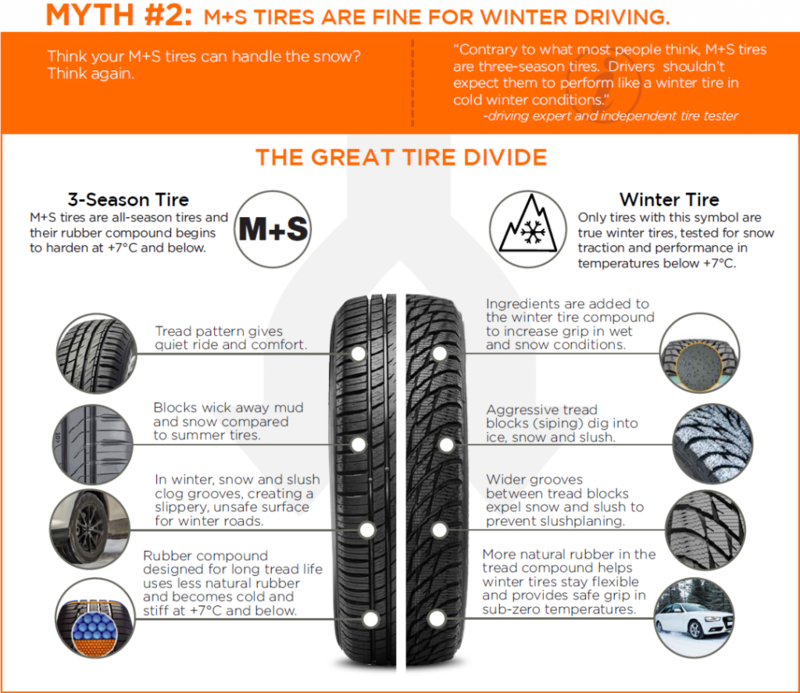 Learn more in our post What’s the Difference Between Winter Tires & M+S Tires? What’s important to remember here is these electronic systems won’t have much grip to work with at a slippery intersection if your tires are 3-seasons that have gone stiff in the cold. For this myth, and the others, it comes down to expanding your margin of safety—for you and all the other people on the road. We all want our vehicles to stop in time and stay on the road, and we want the vehicles driving around us to stop in time too. So, on winter roads this year, make the 7 Degree Switch—and don’t be that guy! Not sure which winter tires or all-weather tires suit your driving needs? Talk to Kal! Visit us at one of our Kal Tire locations near you, or visit our website, where you can shop for tires and get expert advice via live chat, email or phone.